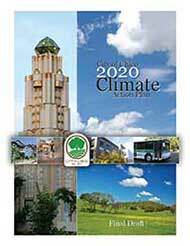 The inventory was calculated using the Clean Air and Climate Protection (CACP) software developed by ICLEI. The CACP software is an emissions-management tool that allows the user to track electricity and natural gas consumption, vehicle miles traveled, and solid waste tonnages. The software then converts the data into quantified GHG emissions. Generating this emissions inventory required the collection of information from a variety of sources, including the Pacific Gas and Electric Company (PG&E), the California Public Road Data—Highway Performance Monitoring System, the California Integrated Waste Management Board, the City of Chico, and Butte County Solid Waste Management. Once the inventory baseline was established, it became possible to project future emissions levels. That forecast, known as a “Business as Usual” Emissions Scenario, represents a critical tool for gauging the extent of actions necessary to reduce emissions to target levels. The scenario assumes that all emissionsproducing activities continue at the same level as in 2005, with no action taken to mitigate emissions. It also takes into account population growth and the associated increase of GHG emissions. Each sector has a different relative overall contribution to emissions levels, and each has a slightly different growth rate. A copy of the complete Inventory is attached to this document. After making the necessary emissions-factor adjustments, the baseline emission level was revised to 516,869 MtCO2e. The inventory found 64% of the emissions came from the transportation sector, 16% from commercial energy consumption, 14% from residential energy consumption, 5% from solid waste sent to the landfill, and less than 1% from industrial energy consumption. Given a population of 94,887 in 2005, the annual per capita emissions generated during the base year translated to approximately 5.45 MtCO2e per person. The basic process of an emissions inventory comprises identifying the activities that generate emissions, quantifying the scale on which they are occurring, and converting those aggregated impacts into a measurement of GHG emissions. That final conversion is made using what is known as an emissions factor: a coefficient that represents the per-unit emissions generated by an activity. The emissions factor for energy consumption that had been used in the original inventory was based on an average of several utility companies in the Pacific Northwest region; this was the default calculation in the CACP software. The Chico community, however, is primarily served by only one energy utility, Pacific Gas and Electric (PG&E). Many of the other utilities included in the default average had “dirtier” grid mixes than PG&E in terms of GHG emissions, due in part to PG&E’s expansive hydroelectric generation. Using the default average resulted in an over-inflated emissions impact from the consumption of energy by the Chico community. Subsequently, City staff received energy-generation figures from PG&E and calculated an emissions factor specific to the Chico area. City staff adjusted the baseline emissions levels accordingly. Part of the inventory process involved projecting future growth by looking at five growth factors, one for each sector — solid waste, transportation and residential, commercial and industrial energy use. The original GHG Emissions Inventory used the best available default growth averages available at that time to project the “Business as Usual” 2020 emissions. Shortly after the inventory was completed, the city began updating its General Plan. The Climate Action Plan is a companion document to the General Plan Update (GPU); thus, the future emissions projections were recast based on the residential, commercial and industrial growth rates used in the GPU, rather than the default averages initially in the inventory.